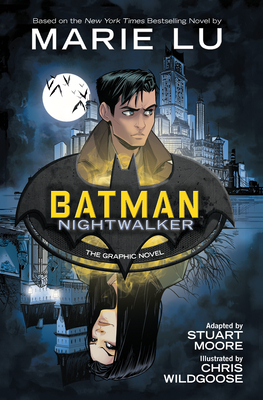 This action-packed graphic novel based on the New York Times bestselling novel by Marie Lu transports readers to the shadowy gates of Arkham Asylum, where Gotham City's darkest mysteries reside...and now it threatens to imprison young Bruce Wayne. A new ruthless gang of criminals known only as Nightwalkers is terrorizing Gotham and the city's elite are being taken out one by one. On the way home from his eighteenth birthday party, newly-minted billionaire Bruce Wayne makes an impulsive choice that puts him in their crosshairs and lands him in Arkham Asylym, the once infamous mental hospital. There, he meets Madeleine Wallace, a brilliant killer...and Bruce's only hope. Madeline is the mystery Bruce must unravel, but is he convincing her to divulge her secrets, or is he feeding her the information she needs to bring Gotham City to its knees? Illustrated by Chris Wildgoose and adapted by Stuart Moore, this graphic novel presents a thrilling new take on Batman before he donned the cape and cowl. Marie Lu is the #1 New York Times bestselling author of the Legend trilogy and The Young Elites trilogy. She graduated from the University of Southern California and jumped into the video game industry, working for Disney Interactive Studios as a Flash artist. Now a full-time writer, she spends her spare time reading, drawing, playing Assassin's Creed, and getting stuck in traffic. She lives in Los Angeles, California (see above: traffic), with one husband, one Chihuahua mix, and two Pembroke Welsh corgis.